1. Division of Chronic Infection and Cancer, National Institute of Public Health. Av. Universidad 655, Cuernavaca, Morelos. México. 62100. 2. Biotecnhgology Institute. National Autonomous University of Mexico, Cuernavaca Morelos, México. 3. School of Biological Sciences, Autonomous University of Nuevo León, Monterrey, México. Human papillomavirus (HPV) is a DNA virus that infects epithelial cells and has been implicated in the development of cervical cancer. Few therapeutic strategies have been designed for the treatment of cervical intraepithelial neoplasia, a precursor of cervical cancer. In these early stages, the HPV E2 protein is the most important viral factor involved in viral gene expression and plays crucial roles during the vegetative viral cycle in epithelial cells. Papillomavirus E2 binds specifically to palindromic ACCN6GGT sequences, referred to as the E2 binding sites (E2BS), which are concentrated within the viral long control region, and which are responsible for regulation of the HPV protein's expression. Here, we consider E2BS as a candidate sequence to induce the expression of antiviral therapeutic genes selectively in HPV-infected cells expressing the E2 protein. This study focuses on the use of an HPV-specific promoter comprised of four E2BS to drive the expression of IL-12, leading to an antitumor effect in an HPV-positive murine tumor model. The therapeutic strategy was implemented via viral gene therapy using adenoviral vectors with recombinant E2 and IL-12 genes and E2BS-IL-12. We demonstrate that the HPV-specific promoter E2BS is functional in vitro and in vivo through transactivation of HPV E2 transcription factor. Keywords: HPV, promoter, IL-12, gene therapy, adenovirus, HPV E2, antitumor. Cervical cancer (CC), which is associated with persistent infection with high-risk human papillomavirus (HPV), is one of the most important neoplasias in global public health1. The high incidence of mortality and morbidity caused by this cancer, exceeded only by breast cancer in some populations2,3, warrants special attention toward the development of new strategies for control and treatment at early stages to prevent disease evolution. One approach that has been extensively investigated is gene therapy 4,5, which has been shown to have antitumor activity through induction of cell death. Most gene therapy studies have been based on therapeutic genes under the control of ubiquitous promoters such as CMV, SV40, heat shock, etc., which induce low specific toxicity in normal cells and tissues, as well as in cancer cells6,7. The targeted expression of therapeutic genes is essential to minimize the toxic effects due to the use of the recombinant protein 7-10 and to maximize the therapeutic effect. One gene therapy approach that has been used to target HPV-cancer cells in murine tumor models takes advantage of the HPV16 Long Control Region (LCR) DNA sequence to manipulate gene expression in HPV-infected cells and uninfected cells. However, the LCR of HPV is activated in both HPV16-infected cells and non-infected cells11,12. Nevertheless, other HPV-specific sequences that are controlled only by HPV proteins may have applications in therapies for precancerous lesions and cervical cancer. The HPV E2 proteins have the same functions in the more than 100 characterized papillomavirus genotypes and are key regulators of the viral life cycle13,14. E2 protein functions are mediated through protein-protein interactions and through the binding of E2 to a palindromic DNA sequence ACCN6GGT, referred to as the E2 binding site (E2BS)15-17. E2BS merits consideration as a candidate sequence to drive the expression of therapeutic genes only in HPV-infected cells that express the HPV E2 protein. The construction of an HPV-specific promoter to induce expression of immunoregulatory cytokines, such as IL-12, is a promising approach with potential applications in the treatment of precancerous lesions before HPV integration. Interleukin 12 (IL-12) is a cytokine with multiple immune functions, including the stimulation of antitumor immune responses, but it has not yet become a standard therapeutic agent in clinical care18. Numerous preclinical studies demonstrated the benefit of IL-12 in several different tumor models, and these positive results led to clinical trials19-24. In cervical cancer a predominance of the Th2-type cytokine profile is observed in association with a diminished Th1-type cytokine profile 25-28. The shift to Th2-type cytokines during the course of cervical cancer development is reflected in an increased serum concentration of Th2-type cytokines while concentration of the tumor-infiltrating T-lymphocytes decrease as the lesion progresses28-30. Therefore, upregulation of cytokines such as IL-12, which favors the development of Th1 cells, through an HPV-specific promoter represents a promising approach to induce activation of the immune response in precancerous lesions, as well as to inhibit Th2-type cytokines, in order to prevent progression of the malignancy. The objective of this study was to utilize an HPV-specific promoter comprised of four E2BS's to induce expression of IL-12 and produce antitumor effects in an HPV-positive murine tumor model. The therapeutic strategy was implemented through viral gene therapy using adenoviral vectors with recombinant E2, IL-12 genes and E2BS-IL-12. We demonstrated that the HPV specific-promoter E2BS was functional in vitro and in vivo due to transactivation by the HPV E2 transcription factor. Cell Culture. The BMK-16/myc murine cell line was kindly donated by Dr. Sophie Hallez (Université Libre de Bruxelles, Rhode-Saint-Genèse, Belgium). This cell line was established by co-transformation of baby BALB/c kidney cells with the c-myc gene and the HPV 16 genome, as previously described31. The C-33 A (ATCC) and AD293 (Stratagene, Calif., USA) were grown in a DMEM medium (Invitrogen, Carlsbad, Calif., USA) and supplemented with 10% fetal bovine serum, penicillin/streptomycin (50 ug/ml), 2 mM L-glutamine and 250 ng/ml fungizone (Invitrogen) at 37°C in 5% CO2. Plasmids. The E2-pCMVp16 plasmid (which contains the open reading frame (ORF) of the gene encoding the HPV16 E2 protein) and pC18SP1Luc plasmid (which contains four response elements to the E2 protein of HPV16 and a SP1 luciferase reporter gene site) were donated by Dr. G Veress (School of Medicine, University of Debrecen, Hungary)32 The plasmid pNGVL3-mIL-12, which contains clones of the two subunits (p35 and p40) of mouse. Plasmids were propagated in DH5-α bacteria and were purified by alkaline lysis; integrity was verified on 0.8% and 1% agarose gel. Construction of Recombinant Adenovirus. Using the AdEasy system, recombinant bacterial adenovirus was generated with defective replication. The pAdtrack-CMV plasmid was used to clone the IL-12 gene with the cytomegalovirus promoter (CMV) as the promoter sequence. The plasmid pAdTrack was used to clone the IL-12 gene with 4 E2 binding sites (E2BS) as the promoter sequence. Briefly, the recombinant adenovirus AdCMVmIL-12 was generated by cleaving the two subunits (p35 and p40) of the IL-12 gene from the plasmid pNGVL-3-mIL-12 at the restriction sites Bgl II and EcoR V. The gene was cloned into these same sites in the IL-12 pAdTrack-CMV vector, and clones were selected with kanamycin. The adenoviral vector AdE2mIL-12 expressing IL-12 under control of the four E2BS as its promoter sequence was generated as follows. The E2Sp1 promoter was cleaved at the sites BamH I/Hind III from the plasmid pC18SP1Luc and was cloned into the pCDNA3 vector to be sequenced and was sub-cloned into the pAdTrack vector at the Hind III/EcoR V sites. The vector generated, pAdTrack SP1E2, was cloned into the EcoR V and Bgl II sites and the two subunits of IL-12 were released at the same sites of the aforementioned pNGVL3-mIL-12 construction. Thus the pAdTrack-E2mIL-12 plasmid was generated and the poly-adenylation sequence was amplified by PCR from the original vector mIL-12, and was cloned into the unique Bgl II site (pAdTrack-E2mIL-12), with orientation verified by PCR. The plasmids generated were recombined with the plasmid pAdenoEasy 1 in BJ5183 E. coli to generate a recombinant plasmid. Finally, recombinant plasmids were cut with the restriction enzyme Pac I and transfected into AD293 cells to generate the adenoviruses AdCMV, AdCMVmIL-12 and AdE2mIL-12. 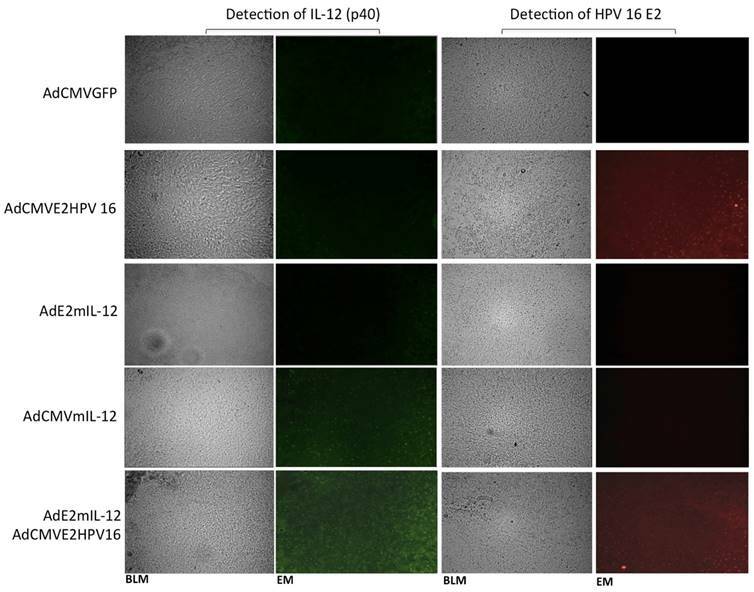 Virion production was monitored by detection of the green fluorescent protein (GFP) produced by the virus, which was visualized by vertical epifluorescence microscopy. Cells were harvested in the presence of 5 mL of buffer A (10 mM Tris HCL, 0.5 M NaCl2, pH. 8.0), then were centrifuged at 3,000 rpm and lysed (by heat and cold). The lysate was centrifuged at 3,000 rpm for 5 min at 4° C, and the supernatant was used for large-scale production of recombinant adenoviruses. T75 twenty culture dishes with 100% confluence of AD293 cells were infected with 1 mL of the supernatant. Five days after infection the cells were harvested with shaver (scraper) in the presence of 10 ml of buffer A. The cells were lysed by heat and cold and centrifuged at 3,000 rmp. Virions were purified from the supernatant by CsCl gradient ultracentrifugation (32,000 rpm, 18 h at 4° C), dialyzed and stored at -70° C. Viral titers (PFU) were determined by plaque assays in AD293 cells according to the protocol of Vogelstein33 Western blot analysis was used to verify production of E2 and IL-12 protein in AD293 and BMK-16/myc cells. Additionally, we generated an adenovirus expressing GFP (AdCMVGFP) as a control. Tumor growth inhibition assay. Tumor model: preclinical evaluation was carried out in an HPV 16-positive murine tumor model.34 5x105 BMK-6/myc cells were injected subcutaneously into the back of Balb/c mice at a previously shaved site. Each group of five mice (provided by the animal facility of the National Institute of Public Health, strain from Charles River Laboratories, Wilmington, MA, USA), had their tumor volume measured in mm3 every 3 days (V = larger diameter X smaller diameter2)/2 and their survival was reported. Tumor volume was studied to determine the therapeutic effect of the recombinant adenovirus. Tumor volume of 20 to 30 mm3 was considered time zero and the subsequent effect of adenovirus on tumor growth and mouse survival was measured. Administration of recombinant adenovirus was as follows: each group of five mice with a tumor volume of 20-30 mm3 had 5X105 PFU of recombinant virions containing either AdCMVE2HPV16, AdCMVmIL-12 or AdCMVGFP, administered intra-tumorally in a final volume of 30 ul in 1X PBS. Another group of five mice had 5x103 PFU of each adenovirus (AdCMVE2HPV16, AdE2mIL-12) co-administered intra-tumorally in a final volume of 30 uL. All mice were monitored for a period of 28 days; tumor inhibition was determined by measuring tumor volume (mm3) every three days with a digital caliper and survival curve. Western Blot Assay. BMK-16/myc cells, C-33 A and AD293 were harvested at 48 h after the infection with recombinant adenovirus and were lysed in cold RIPA lysis buffer (20 mM Tis-HCl, pH 7.4, 10 mM NaCl, 10 mM KCl, 3 mM MgCl2, 0.5% triton X-100, 0.5% NP-40 and protease inhibitors). The proteins were then collected by centrifugation. Protein concentrations were determined using the BCA protein assay kit (Pierce, Rock- ford, Ill., USA), according to the manufacturer's instructions. Approximately 50 ug of total protein were electrophoresed in SDS-PAGE 10% and the resolved proteins were transferred to nitrocellulose membranes (Amersham Biosciences, Piscataway, N.J., USA). The blots were blocked in 5% dry non-fat milk in TBS (20 mM Tris-base, pH 7.6, 137 mM NaCl and 1 M HCl) with 0.05% Tween-20 for 2 h. Later, the membrane was washed with PBS 1X and incubated with the appropriate antibody for 16 h at 4°C. The membrane was incubated with the secondary antibody for 30 to 45 min at room temperature. The detection was carried out using ECL Western Lightning Chemiluminescence Reagent Plus (PerkinElmer Life Sciences, Boston, Mass., USA). The antibodies were diluted in 2.5% dry non-fat milk in Tween-20 TBS solution. The antibody dilutions used were anti-actin (dilution 1:1,000), anti-IL-12, p40, (dilution 1:500), anti-goat HRP (dilution 1:10,000) and anti-mouse (dilution 1:8,000; Santa Cruz Biotechnology, Santa Cruz, Calif., USA). Immunohistochemistry. Biopsies of tumor-bearing mice treated intratumoral with the recombinant adenovirus were paraformaldehyde-fixed. Serial frozen tissue sections were cut into 10 μm generated by transversal cryo-sections fixed in acetone and methanol for 10 min and washed in PBS for 3 min at room temperature. After the tissues were blocking for 30 min with 5% BSA and wash in PBS 0.2% Tween 4 times for 5 min, and were permeabilized with 0.2% Triton for 10 min. The incubation of the primary antibodies was done overnight at 4ºC, follow with a wash in PBS 0.2% Tween 4 times for 5 min at room temperature. Slides were then incubated with conjugated secondary antibody 30 min to 1 hr at room temperature. Fluorescence was visualized with Zeiss Axioskop Epifluorescencet microscope (Zeiss, Germany). Images were acquired using a Micro-Manager-Examiner 1.2, 20X. The antibody dilutions anti-IL-12 p40 (dilution 1:500), serum anti-HPV16 E2 protein (dilution 1:250)34 and conjugated secondary antibody anti-goat Cy3 (1:1000) for IL-12 and Anti-mouse (1:1000) by HPV 16 E2 (Jackson ImmunoResearch LABORATORIES, INC. (West Grave, PA.USA). Data were analyzed and provide average (X) and standard error (s). Additionally, an analysis of Student´s t-test STATA 9.1., was done to determine differences between the experimental groups. A P value of ≥0.05 significance values was used for all statistical tests. Generation of recombinant adenovirus. 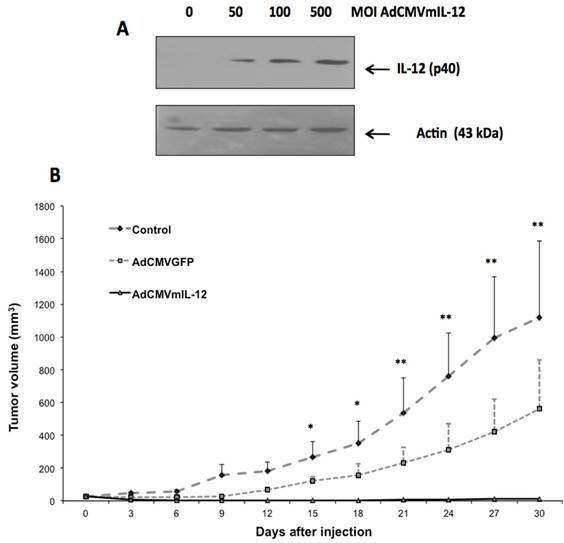 AD293 cells were infected with 50 MOI of the recombinant adenovirus: AdCMVGFP, AdCMVE2HPV16, AdCMVmIL-12 and AdE2mIL-12 for large-scale production and the virions was monitoring by the detection of GFP expression. As shown figure 1, GFP expression was visible 48 hr after the infection in 80-90% of the cells showing cell rounding and small amounts of clumping with cytopathic effects. Production of recombinant adenovirus monitored by GFP expression. AD293 cells transfected with 50 MOI of each recombinant adenovirus (AdCMVGFP, AdCMVE2HPV16, AdCMVmIL-12 and AdE2mIL-12); 24 hr later the cells infected were observed on Epifluorescence microscopy and the expression of GFP protein was monitored. The cells showed cell rounding and small amounts of clumping with cytopathic effects. Control: AD293 cells no infected. Expression of AdCMVIL-12 in vitro and antitumor effect in vivo. In BMK-16/myc cells transduced with AdCMVmIL-12, we detected the p40 subunit of IL-12, which has a molecular weight of 40 kDa, by Western Blot (Fig. 2A); IL-12 p40 was not detected in uninfected cells. Detection of p40 protein was dose-dependent and correlated with the MOI of AdCMVmIL-12 with which epithelial cells were infected. We found that intratumoral injection of AdCMVmIL-12 into tumor-bearing mice was associated with a decrease in tumor size over time. In 80% of mice almost complete resolution of tumor was observed and this was maintained up to 30 days after injection (Fig. 2B). In contrast, the tumor-bearing mice injected with AdCMVGFP showed only a slight reduction in tumor growth, and continued to have sustained growth, while the untreated mouse controls showed continuous growth of tumor. In vitro and in situ activity of an HPV-specific promoter in epithelial cells. Prior to its application in the in vivo tumor model, we evaluated the HPV-specific promoter comprised of four E2 protein-binding sites which induces IL-12 expression using recombinant adenovirus AdCMVE2HPV16, which expresses the HPV 16 E2 protein.18 BMK-16/myc cells were co-infected with AdE2mIL-12 (50 MOIs) and increasing concentrations of AdCMVE2HPV16 and was detected the E2 protein. Induction of the p40 subunit of IL-12 was detected at a concentration of 10 MOIs of the recombinant adenovirus AdCMVE2HPV16, but detection of p40 subunit of IL-12 was more evident at 50 and 100 MOIs after AdCMVE2HPV16 infection (Fig. 3A). These results demonstrate the functional activity of this HPV E2-specific promoter in an in vitro system. Addition, the in vitro activity of the HPV E2-specific promoter was evaluated in HPV-negatives epithelial cells. The AD293 and C-33 A cells were co-infected with AdE2mIL-12 (50 MOIs) and of AdCMVE2HPV16 (50-100 MOI). Twenty hours after the AdE2mIL-12 infection, neither of the cells expressed the HPV E2 and p40 (IL-12) proteins. However, when the cells were infected with AdCMVE2HPV16, the induction of the p40 subunit of IL-12 was detected, and it was determined that it was relate to the expression of the HPV E2 protein in HPV-negatives cells and that it was dose-dependent (Fig. 3B). Furthermore, the in situ activity of HPV E2-specific promoter was evaluated in the in tumor-bearing mice injected intratumorally with co-administration of the adenovirus AdCMVE2HPV16 and AdE2IL-12 (Fig. 4). The p40 subunit of IL-12 was detected in tumor tissues 48 hours after the administration with both recombinant adenovirus and the detection was more evident that the mice treated with AdCMVmIL-12. Coinjection with AdE2IL-12 and AdCMVE2HPV16 induces tumor inhibition in vivo. Coinjection of AdE2mIL-12 and AdCMVE2HPV16 into tumor-bearing mice produced a complete regression of tumor in the time period assessed. 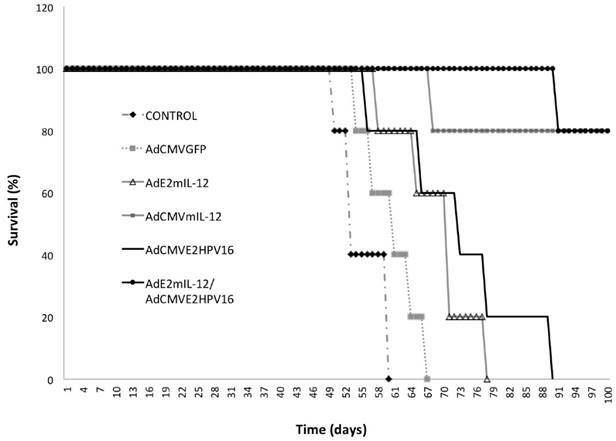 Approximately five days after treatment with both adenoviruses, reduction in tumor growth was observed (Fig. 5). There was no difference in tumor inhibition between the group of mice treated with the AdE2mIL-12 and AdCMVE2HPV16 coinjection and the group of mice treated with the AdCMVmIL-12 alone, in the tumor volume analyzed. On the other hand, the group of mice treated with AdCMVE2HPV16 alone showed an inhibition of tumor growth, which was maintained up to 15 days after the injection, at which point tumor growth resumed although at a slower pace. Survival curves of tumor-bearing mice treated with recombinant adenovirus. We detected a slight increase in the survival of mice treated with AdCMVGFP and AdE2mIL-12 adenoviruses compared to controls (Fig. 6). A survival advantage was detected in mice treated with AdCMVE2HPV16 (57% more than control) but the greatest effect on survival was observed with treatment with AdCMVmIL-12 and co-injection of AdE2mIL-12 and AdCMVE2HPV16. Coinjection of both viral vectors had tumor inhibitory effects in 4 of 5 (80%) mice, and we observed a significant survival of mice compared with the control group. Transcriptional induction of IL-12 by HPV 16 E2 protein through the HPV E2-specific promoter. A). BMK-16/myc cells (HPV 16 positives) were co-infected with adenovirus AdE2mIL-12 (MOI 50) and with increasing doses of adenovirus AdCMVE2HPV 6 (5-100 MOI), 48 hrs after treatment, presence of mIL-12 protein was detected by western blot. B). HPV-negative AD293 and C-33A cells were co-infected with AdE2mIL-12 (50 MOIs) and AdCMVE2HPV16 (50-100 MOI); 48 hrs after infection, HPV 16 E2 protein and p40 protein (IL-12) were detected the by Western blot. Antitumor Effect of HPV 16 E2 gene and IL-12 by recombinant adenoviral vectors evaluated in an HPV 16-positive murine tumor model. BALB / c mice with a tumor induced by administration of BMK-16 / myc cells were treated with recombinant adenoviral vectors AdCMVE2HPV16, AdCMVmIL-12, AdE2mIL-12, AdCMVGFP and co-administration of AdE2mIL-12 adenovirus and AdCMVE2HPV16. Subsequently, tumor growth was assessed at different over time. Data are presented as *X ± SE. P <0.0001 compared between groups. Data are presented as X ± SE. *P <0.05: AdCMVmIL-12 and AdCMVGFP versus controls. **P <0.01: AdCMVmIL-12 and AdCMVGFP versus controls (Student´s t-test). 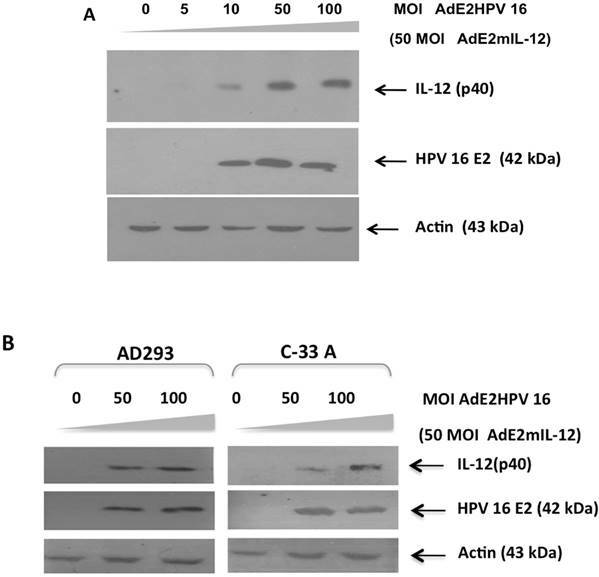 Detection of in situ of the proteins expressed by recombinant adenovirus and the activity of HPV E2-specific promoter. Tumor-bearing mice were injected intratumoral with 5X105 PFUs of recombinant adenovirus AdCMVE2HPV16, AdCMVmIL-12, AdE2mIL-12 and AdCMVGFP and was the proteins mIL-12 and HPV 16 E2 were detected by immunohistochemistry. 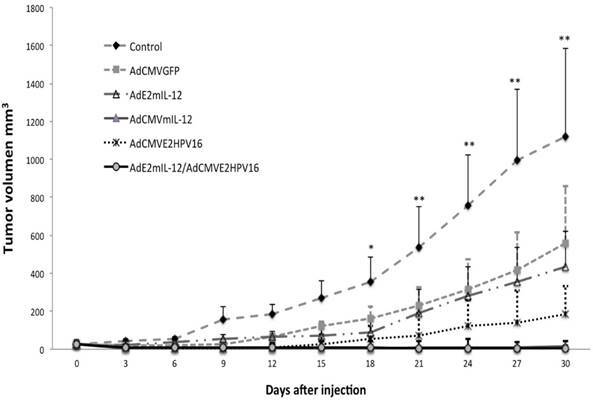 Additionally, other group of tumor-bearing mice was injected with 5x103 PFU of each adenovirus (AdE2mIL-12, AdCMVE2HPV16) and the activity of HPV E2-specific promoter was evaluated. Magnification: X20. BLM: Bright field microscopy, EM: Epifluorescence microscopy. Survival of tumor-bearing mice treated with recombinant adenoviruses. In the present study, we demonstrate that in vivo application of an HPV E2-specific promoter to induce expression of IL-12 in HPV 16-positive tumor-bearing mice using viral gene therapy, lead to significant inhibition of tumor growth and increased survival in this murine tumor model. In precancerous cervical lesions, the HPV E2 protein appears to play a role in the viral life cycle by regulating the transcription and replication of viral genes.14-16 These biological functions of E2 are mediated through the binding of a palindromic DNA sequence, ACCN6GGT, referred to as the E2 binding site (E2BS) in all papillomavirus.15-17 This observation led us to hypothesize that E2BS of HPV would be a candidate sequence to drive the expression of therapeutic genes and inhibit cancer development in precancerous cervical lesions. We found that an HPV E2-specific promoter that drives the expression of IL-12 had functional activity in vitro and in vivo mediated by the viral gene. In the in vitro system, we determined that the HPV E2-specific promoter is trans-activated by the HPV 16 E2 protein and is dose-dependent on HPV 16 E2 protein concentration. Additionally, we demonstrated that the HPV E2-specific promoter would not be activated in cells HPV-negatives (C-33 A), and that the presence of the HPV E2 protein was necessary to promote the activation. However, it is necessary to evaluate the HPV E2-specific promoter in other epithelial cells and in vivo HPV-negative systems. In our experimental system, we used the four E2 transcriptional elements with two SP1 transcriptional elements as a promoter to drive IL-12 expression by means of recombinant adenovirus. This technique stands in contrast with other systems that employ complete sequences in the HPV genome such as the LCR, which can be regulated by the E2 protein, or general transcription factors expressed in both HPV-infected and un-infected cells32. In vivo analysis of the HPV E2-specific promoter's ability to induce IL-12 expression in tumor-bearing mice, demonstrated the promoter's functionality. Treatment was associated with the inhibition of tumor growth and increased survival in the HPV 16 positive murine tumor model. 80% of tumor-bearing mice coinjected with the adenoviral vectors AdCMVE2HPV16 and AdE2mIL-12 showed almost complete tumor suppression 30 days after injection. This result is significant, as the viral sequence (E2BS) may have potential therapeutic applications. On the other hand, we observed a partial antitumor effect after injecting the recombinant adenovirus in the animal tumor model. This effect was detected until 10 days after the administration, later the tumor growth depends on the effect of the therapeutic genes. It is documented that the single administration of the recombinant adenovirus to the tumor tissue favors the activation of specific immune responses, involving the recruitment and activation of inflammatory cells to viral antigens 35-37. Therefore, the activation of the immune response depends of the production of the viral antigens, which is restricted by the replication incompetent adenovirus. The local immune response generated by the recombinant adenovirus, involving the expression and presentation of viral antigens by the tumor cells, together with the activation of T cells promotes the antitumor effect, but this effect is transitory. Also, an antitumor effect was observed when the tumor-bearing mice were treated with AdCMVE2HPV16, a significant reduction was observed in corporation with the control (p<0.01). Previously, we shown the ability of the HPV 16 E2 protein (using the recombinant adenovirus AdCMVE2HPV16) inhibited cell growth and promote cell death by apoptosis in both human and murine HPV 16 transformed epithelial cells as well as we observed anti-tumor effects in vivo HPV 16 tumor-bearing mice.34 Nevertheless, the antitumor effect of the AdCMVE2HPV16 was lower than the one observed with AdCMVmIL-12 and with the co-administration of AdCMVE2HPV16 and AdE2mIL-12. 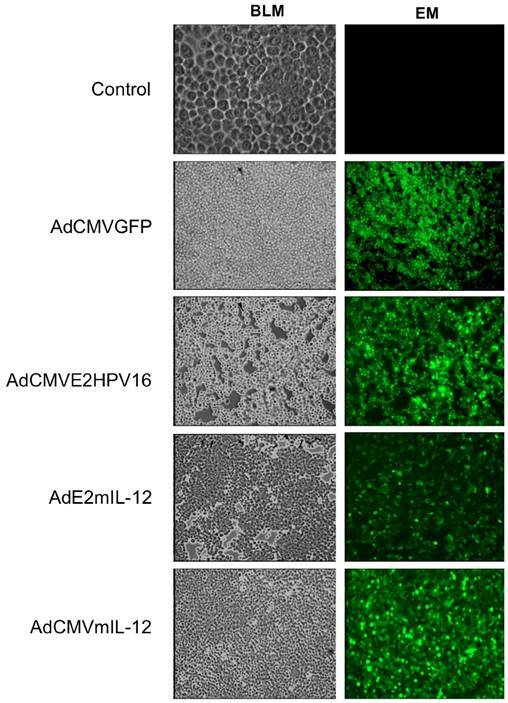 The activation of immune response by the IL-12 protein produced by the AdCMVmIL-12 and AdE2mIL-12 has greater antitumor effect than the HPV 16 E2 protein produced by AdCMVE2HPV16. However, not differences in the antitumor effect were observed using AdCMVmIL-12 or co-administration of the AdCMVE2HPV16 and AdE2mIL-12. The production of the IL-12 protein by the adenoviruses induces the same antitumor effect using the same tumor volume; perhaps differences on growth tumor inhibition using the AdCMVmIL-12 or co-administration of the AdCMVE2HPV16 and AdE2mIL-1 can be observed in larger tumor. Which present a greater range to observed differences in the production of the IL-12 protein related with the increase to the tumor growth inhibition. The antitumor effect of gene therapy using IL-12 has been demonstrated in a number of preclinical models in relation with the recombinant protein use.21-24 However, most of these studies used ubiquitous promoters to regulate expression of the therapeutic genes, which causes low-specific toxicity to normal tissues.7,8 For this reason it is necessary to develop novel cancer-specific promoters selective for HPV-infected cells, to ensure expression of the therapeutic gene in infected cells and avoid gene activation in normal cells and tissues. The HPV E2-specific promoter represents a sequence with potential therapeutic implications in cervical precursor lesions,38-40 at which point the HPV genome exists as an extrachromosomal element and the E2 protein is continuously expressed. However, in malignant cervical lesions, the chromosomal integration of HPV frequently results in disruption of the E2 open reading frame and consequent loss of E2 protein,15,16 in which case the HPV E2-specific promoter would not be functional. The therapeutic application of the AdE2mIL12 in cervical precursor lesions, with the intrinsic expression of HPV E2 protein, could favor the activation of the cellular immune response in early stages and prevent progression malignancy. This therapeutic strategy will be applicable in cervical precursor lesions associated with someone HPV genotypes. All the papillomavirus express the E2 protein and interact with the E2BS, and will be could potentially activate the expression of IL-12 (of the AdE2IL-12) and stimulation of the cellular immune response. Furthermore, It is necessary to consider that the toxicity associated with the in vivo administration of adenovirus vectors and the pre-existing immunity to the prevalent adenovirus serotypes acquired as a result of natural infections,41 have the potential to modulate vector efficacy and safety.41-43 As these, vectors have been improved; the gene delivery technologies have rapidly evolved and thus it is important to investigate other options such as noviral biological agents, including liposomes, exosomes, ex-vivo gene transfer, DNA nanostructures, mesenchymal stem cells, and nano-biopolymers.44-49 Also, the systemic therapy for cancer carried out with IL-12 is associated with toxicity; therefore, the local application using gene therapy should results in a much higher local IL-12 concentration, and consequently a greater beneficial effect in terms of tumor immunity.24 Furthermore, combining a gene transfer with other breakthroughs from biomedical research and novel biotechnologies opens new avenues for the treatment of cervical cancer and precancerous lesions with gene therapy. In summary, we have demonstrated that the HPV E2-specific promoter driving the expression of IL-12 has functional activity in vitro and in vivo, and has the capacity to significantly inhibit tumor growth in an HPV 16 positive murine tumor model. Further investigation is being carried out to optimize gene delivery methods, dosing and administration. The funds for this work were obtained from the Mexican government through a Grand National Council of Science and Technology (CONACYT) with file numbers: Conacyt-Desarrollo Científico para Atender Problemas Nacionales 2013-215484. We thank to the National Advanced Microscopy Laboratory, Biotechnology Institute. National Autonomous University of Mexico, Cuernavaca Morelos, México. Corresponding author: Vicente Madrid Marina. Division of Chronic Infections and Cancer, National Institute of Public Health, Av. Universidad 655, Col. Santa María, Ahuacatitlán. Cuernavaca, Morelos. México. 62100. Tel: (+52-777) 329-30-56 Fax: (+52-777) 317-54-85 Email: vmarinamx.